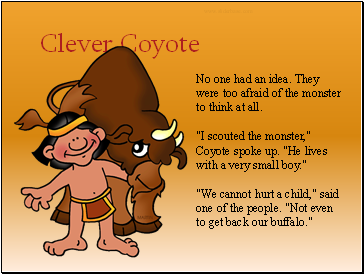 Once upon a time, a long ago, a monster stole all the buffalo from the plains and put them in his mountain hideout. “All for me!” roared the monster. 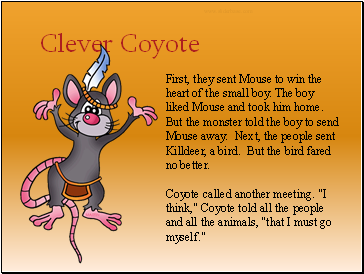 Coyote, a wild dog, called all the people and all the animals together in a great meeting to figure out what they could do. No one had an idea. They were too afraid of the monster to think at all. 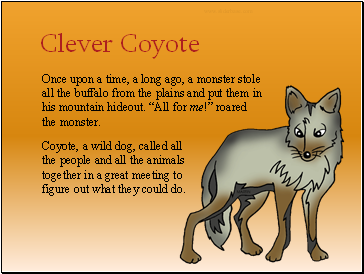 "I scouted the monster," Coyote spoke up. "He lives with a very small boy." "We cannot hurt a child," said one of the people. "Not even to get back our buffalo." to love except a horrible monster. I think we should give him a pet to love. When the chance arises, the pet we send can set the buffalo free." All the people and all the animals thought that was a marvelous idea. First, they sent Mouse to win the heart of the small boy. The boy liked Mouse and took him home. But the monster told the boy to send Mouse away. Next, the people sent Killdeer, a bird. But the bird fared no better. Coyote called another meeting. 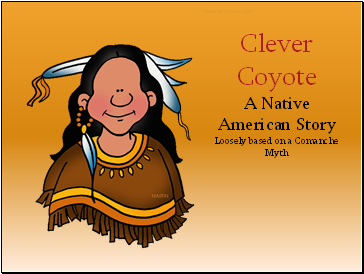 "I think," Coyote told all the people and all the animals, "that I must go myself." That very day, Coyote set out for the monster's lair. 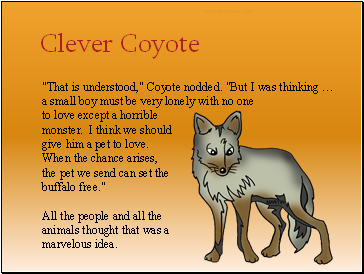 When the boy saw Coyote, his eyes brightened. 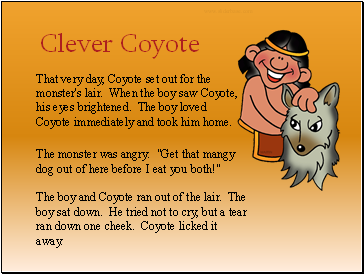 The boy loved Coyote immediately and took him home. The monster was angry. "Get that mangy dog out of here before I eat you both!" The boy and Coyote ran out of the lair. The boy sat down. He tried not to cry, but a tear ran down one cheek. Coyote licked it away. "Poor dog," sniffed the boy. "I bet you're hungry." Coyote put back his head and howled. 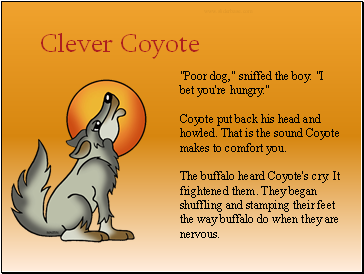 That is the sound Coyote makes to comfort you. The buffalo heard Coyote's cry. It frightened them. They began shuffling and stamping their feet the way buffalo do when they are nervous.